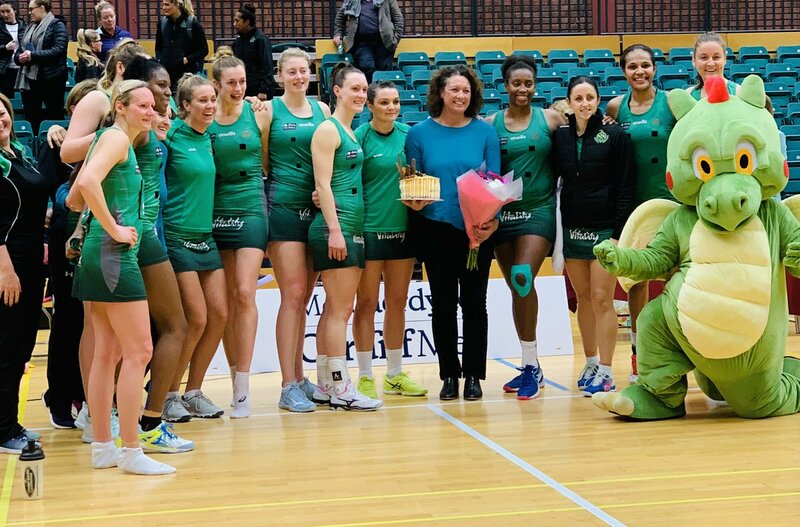 Celtic Dragons players presented head coach Tania Hoffman with a cake to mark her birthday after the match against Saracens Mavericks. Sporting veterans returned to the top tier for Welsh clubs this week – and made an impact. Centre Clare Elsey, aged 40, played for Celtic Dragons in Vitality Netball Superleague, while 44-year-old former World squash number three and British Open squash champion David Evans was in action for Welsh Wizards. Superleague is full of World class netball players, while the Premier Squash League is without doubt the strongest club competition on the planet. It was a treat to watch both players take to the court at Cardiff’s Sport Wales National Centre – and there is no question they love playing at the top level in their sport. Highly experienced Clare Elsey, a former Team Bath, Mavericks and Severn Stars centre, has played in the last two Superleague fixtures for Dragons. Elsey went on as replacement for Australian Kyra Jones against Mavericks at the Sport Wales National Centre in Cardiff. Jones switched to wing-attack in a 66-44 defeat. It was, though, important for Dragons to give Elsey court time and there was a fluency and intensity to her play in mid-court. “I loved it,” said Elsey, who has played in the last two matches for Dragons. “It’s a long time since I have played regularly at this level. I keep trying to retire, but it doesn’t seem to work out. “Tania (Dragons coach Tania Hoffman) gave me a call and it was maybe a bit last minute. I’m just too old for this stuff at 40, but here I am. “I’m sure that’s the oldest in Superleague. “Tania invited me for a training session. I play national league, but the pace of netball in Superleague is completely different. Elsey lives in Bristol and has a highly responsible job at Badminton School in Gloucestershire. After being selected for Dragons, Elsey said: “To be selected and play for this team at such a high level is an absolute honour. I hope I can do the school, myself and girls proud throughout the season. Action: Severn Stars v Celtic Dragons. Pic: CliveJonesPR. Elsey captained England when they became the first ever indoor Netball World Champions in 2016 and said: “I was fortunate enough to captain England into the history books by becoming the first ever Indoor Netball World Champions. David Evans (yellow shirt) in action for Welsh Wizards against RAC’s Ben Coleman. The players settled in for a post-match meal at Cardiff’s Pontcanna Inn, close to the Sport Wales National Centre. Both teams, home and away, were present and David Evans was realistic, saying: “RAC were runners up in the PSL last season and they brought a strong team. “Marwan (ElShorbagy) was close and Edmon (Lopez) was maybe even closer. We felt he might pinch it. “Personally, I didn’t expect to play this season. We joined the League late on and we have been affected by injuries. “Lower down we don’t have the youngsters ready yet. It’s better for me to fill in. What a battle. Welsh Wizards Edmon Lopez (yellow shirt) on the attack against Daryl Selby. Evans played Ben Coleman from Chelmsford, who has a ranking of 52 in the World. Off the court, Evans is Squash Wales Performance Director. He represented Wales at more than 100 major international events, excelled for his country at four Commonwealth Games and helped Wales to a World Team Championship silver medal in 2000. Evans stepped in because Wizards were without Welsh trio Tesni Evans, the World number 12, and her brother Emyr plus Peter Creed. All had commitments on the World tour. Friday 8: Birmingham v Bristol, Coolshurst v Tradition@RAC, Newcastle v Pontefract, Bexley v St George’s. Tuesday 19: Pontefract v WarKens, St George’s v Welsh Wizards, Nottingham v Birmingham, Chichester v Coolshurst..
Friday 22: Newcastle v Bristol, Bexley v Tradition@RAC. Tuesday 2: WarKens v Newcastle, Tradition@RAC v Chichester, Bristol v Nottingham, Birmingham v Pontefract, Welsh Wizards v Bexley. Friday 5: Coolshurst v St George’s. Play-Off semi-finals to be played week commencing May 6, while the final will be at St George’s on Saturday, June 1.